A Japanese skin care salon takes pride in its treatments that address major skin concerns. 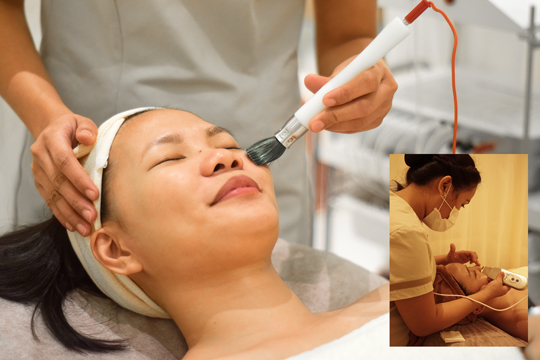 Miss Esthe skin care salon uses a D-Sonic probe that brushes off blackheads and whiteheads for its Pore Reduction treatment, while (inset) it uses the latest ultrasonic micro-vibrations technology that painlessly stimulates dermal collagen production for its Instant Lift treatment. A visit to the Miss Esthe begins with skin analysis to determine the client’s real skin “age,” including spot age (age of the skin based on the appearance of age spots), wrinkle age (age of skin based on the appearance of wrinkles), and skin texture age (age of the skin based on its texture). The esthetician then suggests the treatments needed to address the customer’s present skin conditions. Two of the most sought-after treatments at the facial salon are Pore Reduction and Instant Lift. “If pores are your problem, stop squeezing or picking at your face as it may cause long-term damage and impair your skin’s natural ability to heal itself,” the facial salon said in a statement. Miss Esthe uses a D-Sonic probe that brushes off blackheads and whiteheads through ultrasound micro-vibrations that result in a clear face with tightened, decongested pores. This deeply cleanses the skin in a gentle, non-invasive way (which means no pricking to remove blackheads and whiteheads), followed by the use of Miss Esthe’s house refining essence and mask, after which an ion brush is used to close the pores. Instant Lift, on the other hand, provides immediate picture-perfect skin. Miss Esthe uses the latest ultrasonic micro-vibrations technology that painlessly and safely stimulates dermal collagen production making skin look good sans the sagging. In addition, it is also known for its Whitening, Acne, Sensitive Skin, Glass Facial, Deep Whitening, and Deep Acne treatments. The signature face and décolletage massage is included in all treatments. It also offers a wide range of facial and skin care products—including the Wrinkle Care Serum and Gel with anti-inflammatory and anti-aging peptides, Cleansing and Foam Essence Lotion that addresses different skin needs, and the moisturizing Perfect Oil Serum that corrects texture and prevents formation of wrinkles. All of its products are fragrance-free, coloring-free, paraben-free, and surfactant-free. Miss Esthe is located on the second floor of Uptown Bonifacio Global City. Call 0935-3364720 to make a reservation.